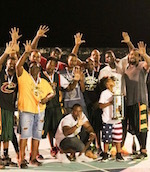 Shottaz is the 5-Peat Champion in Anguilla. They overcame Hoyas 2-0 in the Final series. In Game 1 Shottaz took home the narrow 58:56 victory. Colin Harrigan (183-G, college: Clinton CC, IA) led the scoring for the Shottaz with 19 points, while Daren Webster (G) led the way for the Hoyas with 18 points and 10 rebounds. In Game 2 Shottaz celebrated a 67-61 win and won the Finals. Shottaz posted a 15-8 run in the opening period, but then allowed the opponents to tie it all at the halftime. Shottaz used a strong 24-16 surge to seal the victory. Jason Hodge (201-C/F, college: Oklah.Panhandle) top-scored for the winners with 26 points and 16 rebounds, while Javille Brooks (G) netted 16. Ricky Coombs and Daren Webster netted 17 points each in a loss.